All Barley Products Used for generations as an all-natural way to keep pond water clean and clear. Available in a variety of forms- bales, pellets, flakes, and liquid extract. A Liquid Extract of Barley Straw Especially Helpful Where Bottom Drains Are Present. An environmentally responsible, cost-efficient pond conditioner that is a clean & easy, natural & organic approach to a healthy pond environment. When a pond's ecosystem is mature and balanced, the water is usually clear and healthy for aquatic life. This maturation process is a function of the microbiological and chemical properties of the water. 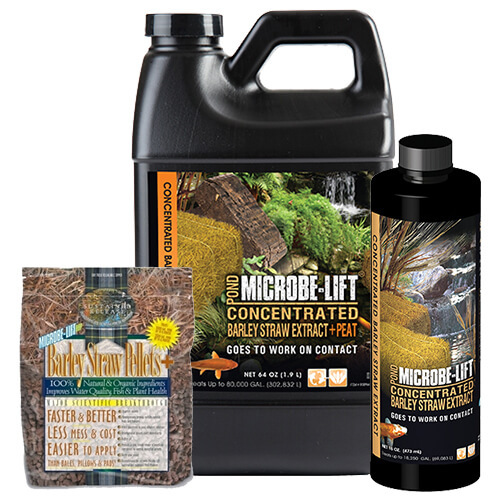 NATURAL CHEMICAL MATURATION - Microbe-Lift Barley Straw LIQUID & DRY formulations help to mature the pond with natural chemicals just as a pure mountain stream matures through the years by the introduction of natural breakdown products from trees, plants, etc. These natural breakdown products often include humic and fulvic acid and organic acids that have a natural ability to sequester, or tie up, inorganic compounds, so their concentrations in the pond don't get to levels that would unbalance the ponds ecosystem. These substances can also lead to natural purification of the pond through a slow release of hydrogen peroxide as they react with sunlight. The hydrogen peroxide is produced at levels that help purify the water while not having any adverse effects on desirable aquatic life. The sequestering, in conjunction with microbiological cycling, provides a stable natural ecosystem in your pond. BIOLOGICAL MATURATION The microbiological maturation process involves development of symbiotic populations of bacteria, which stabilize the critical organic and inorganic components of the pond. The microorganisms do this through their ability to promote "biogeochemical cycles" including carbon, nitrogen and phosphorous cycles - elements critical to all forms of aquatic life. By stabilizing these components, the bacteria prevent pollution of the pond. It can take some time to accomplish this "biological maturation" in a man-made pond and may never occur as the maturation process is constantly interrupted by certain pond practices like cleaning out the pond. The process can be accelerated significantly through the use of Microbe-Lift PL - a virtual "ecosystem in a bottle" - and mimics the complex interdependent populations in a mature pond. up to 500 2 oz .5 oz. .75 oz. 501 - 1,000 3 oz. .75 oz. 1.25 oz. 1,001 - 1,500 4 oz. 1 oz. 1.5 oz. 1,501 - 2,000 6 oz. 1.25 oz. 1.75 oz. 2,001 - 3,000 8 oz. 1.5 oz. 2.25 oz. 3,001 - 4,000 10 oz. 2 oz. 3 oz. 4,001 - 5,000 12 oz. 2.5 oz. 3.5 oz. 5,001 - 6,000 16 oz. 3 oz. 4 oz. 6,001 - 7,000 20 oz. 3.5 oz. 4.5 oz. 7,001 - 8,000 24 oz. 5 oz. 6 oz. 8,001 - 10,000 32 oz. 6 oz. 8 oz. All the Benefits of Concentrated Barley Straw Extract PLUS Added Liquid Peat To Help Maintain An Ideal pH in Alkaline Ponds! Rich in organic peat which softens pond water-reducing nitrate and phosphate concentrations in the water column and provides a buffering agent and ion attenuation in lined ponds that additionally gives them some beneficial properties of earthen ponds! NATURAL CHEMICAL MATURATION Microbe-Lift Barley Straw LIQUID & DRY formulations help to mature the pond with natural chemicals just as a pure mountain stream matures through the years by the introduction of natural breakdown products from trees, plants, etc. These natural breakdown products often include humic and fulvic acid and organic acids that have a natural ability to sequester, or tie up, inorganic compounds, so their concentrations in the pond don't get to levels that would unbalance the ponds ecosystem. These substances can also lead to natural purification of the pond through a slow release of hydrogen peroxide as they react with sunlight. The hydrogen peroxide is produced at levels that help purify the water while not having any adverse effects on desirable aquatic life. The sequestering, in conjunction with microbiological cycling, provides a stable natural ecosystem in your pond. BIOLOGICAL MATURATION The microbiological maturation process involves development of symbiotic populations of bacteria, which stabilize the critical organic and inorganic components of the pond. The microorganisms do this through their ability to promote "biogeochemical cycles" - including carbon, nitrogen and phosphorous cycles - elements critical to all forms of aquatic life. By stabilizing these components, the bacteria prevent pollution of the pond. It can take some time to accomplish this "biological maturation" in a man-made pond and may never occur as the maturation process is constantly interrupted by certain pond practices like cleaning out the pond. The process can be accelerated significantly through the use of Microbe-Lift PL - a virtual "ecosystem in a bottle" - and mimics the complex interdependent populations in a mature pond. Barley straw has been used for hundreds of years to promote clean clear water conditions in ponds and streams. Barley Straw Liquid Extract is a pharmaceutical-grade, fermented barley extract that has been concentrated to give you a clean clear pond. The added enzymes will help reduce pond maintenance by breaking down pond sludge and keeping filter pads cleaner. One pump treats up to 100 gallons of water. New from Tetra, Barley and Peat Extract creates naturally clear water and helps to reduce pond maintenance. Regular use can reduce algae. Natural humic acids from barley straw and liquid peat. Safe for fish and plants. Barley straw has been used for generations as a natural way of treating pond water. Normally, barley straw needs several weeks to start to decay in order to become effective, Aquascape has added bacteria and enzymes to the barley straw to speed up this process. Laguna Barley Straw helps maintain superior pond water conditions in a completely natural way. The Barley Straw comes in small, slow-release pellet form for easy handling and convenience. Barley Straw is completely natural and will not harm fish or plant life. A reusable mesh bag with locking seal. One 2.5 lb bag treats 1250 U.S. gal. and lasts 12 weeks. Aquameds Extract of Barley is the all-natural way to keep pond water clear. Extract of Barley provides the same benefits of barley straw but without the mess of pellets of bales, and works much faster. Enzymes derived from the natural barley fermentation process help promote a healthy and naturally clear pond. Mix with pond water then apply in moving water or around the pond's edge. Directions: Initial dose, use 1 cup (8 oz) per 500 gallons. For maintenance dosing, add 1 oz per 500 gallons. Add maintenance dose every other week. AquaActiv Barley Pond Clarifier is made up of decomposed barley to keep the water clear. Traditionally, barley straw would be used to clear the murky water of the pond. However, it would sometimes cause frustration, due to the straw floating on the surface, giving a messy and unsightly appearance. This clear liquid formula utilizes the traditional method of cleaning murky water, without altering the appearance of the pond. Barley Pond Clarifier is an all-natural product that will keep your water clean and clear. For initial dose, add 4 oz per 600 gallons. 5 mL treats 85 gallons of water. Once per month, apply a maintenance dose of 1 oz per 500 gallons.